Hell yeah! Tell Me What's New is one of the freshest albums I've heard in recent time. The band itself says that their music is a crossroads between Oasis and The Strokes. Both bands are actually much hyped, but Gem are harder than Oasis and more varied in their sound then The Strokes. Although Gem are from the Netherlands, their rock'n'rollish, yes even soulish sound is closer to Swedish acts like the Royal Beat Conspiracy or the Chronics. Gem were discovered on a Dutch talent sampler CD and shortly after released their debut. Most of the songs are pure rock'n'roll, sometimes with a punk attitude (The Opposite, Secrets In Silence), sometimes kept more in the past (Sisters Eyes). 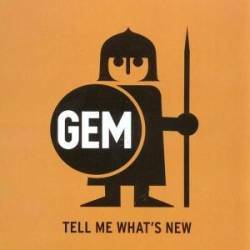 Although I'm really often opposed to retro rock, Gem have found a way to make this music attractive. The reasons are obvious. Gem have a real sense for melodies which you can convince yourself when listening to Tonight or Eyes Open Wide which could be a radio single. The songs don't sound more or less the same which is another point in favour of Gem. Furthermore the raw and entertaining vocals fit just right to this kind of rock music. I can only recommend this CD to every fan of good rock music. Kick out the Gems!! !